State class. This abstract class defines the behaviour of async lookups - which can vary for different ACL types. Today, every state object must be a singleton. See NULLState for an example. no state should be stored in the state object, they are used to change the behaviour of the checklist, not to hold information. If you need to store information in the state object, consider subclassing ACLChecklist, converting it to a composite, or changing the state objects from singletons to refcounted objects. Definition at line 46 of file Checklist.h. Definition at line 51 of file Checklist.h. 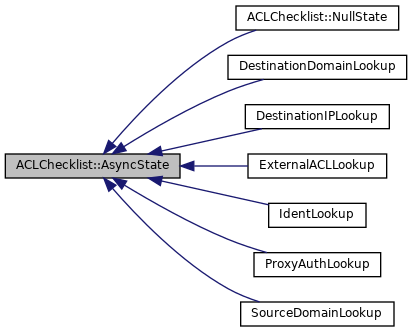 Implemented in ACLChecklist::NullState, DestinationDomainLookup, SourceDomainLookup, ExternalACLLookup, ProxyAuthLookup, IdentLookup, and DestinationIPLookup.